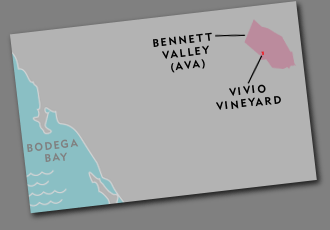 Vivio Vineyard is located in the northern part of Sonoma Valley. It is planted on the side of Mount Taylor at approximately 800 feet above sea level. This twelve-acre, low-vigor site features three clones of Syrah (470, 877 and 174). The vineyard is blessed with cool ocean breezes, light fog and a long growing season. Its reddish clay loam and fractured volcanic rock soils seem ideal for growing Syrah.